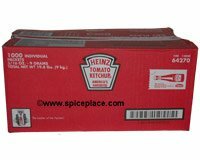 Bulk carton containing 1,000 individual portion packs of famous Heinz ketchup - The leader of the Packets! World Famous Heinz Ketchup is the favorite ketchup of many people. It's the number one brand of ketchup. Use portion packs for picnics, parties, restaurants, food stands and food carts. They're individually sealed, stay clean and sanitary so there is no messy cleanup of containers. Ingredients: Tomato Concentrate Made From Red Ripe Tomatoes, Distilled Vinegar, High Fructose Corn Syrup, Salt, Spice, Onion Powder, Natural Flavoring.